Toronto Hit List: Björk Party, Regretro, Get It Together, Beatlemania & more! 8 pm Call Me Maybe: A Sober Dance Party @ D-Beastro, 1292 Bloor St. W. Come dance or just hang out. D-Beastro will be serving mocktails and spinning pop jams all night long! 10 pm Karaoke @ Bambi’s, 1265 Dundas St. W. A lifetime of karaoke! The cycle of karaoke is never complete! It is at the end as it is at the beginning. 12 pm St. Patrick’s Day Extravaganza @ The Gladstone Hotel Melody Bar, 1214 Queen St. W. The Gladstone is serious about St. Patrick’s Day, real serious. So they’re throwing a beer extravaganza in the name of everyone’s favourite saint! Mill Street Brewery will be on hand to hand out samples of their locally made Stout and other seasonal beers. There will also be entertainment all night starting at 5 pm, including performances by Irish Duo and Nathan Da Silva + DJ Devon Little playing pumpin’ tunes till last call. No tickets necessary, this day drinking party is FREE! 2 pm St. Paddy’s Caskade @ Mascot Brewery & Odd Thomas, 31 Mercer St. This St. Patrick’s day, Mascot Brewery and Odd Thomas partner with East Coast Connected to bring you St. Paddy’s Caskade. They’ll be offering plenty of cask beers to sample from different local craft breweries, a special St. Paddy’s day menu from Chef Rory McGouran, and of course, some tasty Irish whiskey-inspired cocktails. $10-20 advance tickets available online. 8 pm Get Lucky @ The Boat, 158 Augusta Ave. Come out and go on the lash this St. Patrick’s Day in support of HIV and AIDS research! All $10 cover proceeds will be generously donated to the Canadian Foundation for AIDS Research (CANFAR). $5 import/craft beer and shots + $6 premium shots all night. 8:30 pm Spelling Bae @ The Ossington, 61 Ossington Ave. The ultimate spelling competition. Official Canadian spelling bee rules observed. Spell words, drink beer, compete for glory. 9 pm Björk Party @ The Beaver, 1192 Queen St. W. DJ Phil V plays Björk hits, rarities, and remixes all night long! Featuring a special performance by Donnarama. Come dressed to impress people from other planetary lunar systems and living earth matter. 10 pm Get Lo @ Clinton’s, 693 Bloor St. W. Help Bangs & Blush celebrate everybody’s favourite ginger this St. Paddy’s day at Get Lo! They’ll be rolling everything you wanna hear from the ’90s ’til now. No cover! 10 pm Shamrock Shake @ The Steady, 1051 Bloor St. W. Bring your ~*Milkshake*~ to the yard this St. Patrick’s Day and shake, shake, shake it up in celebration of the anniversary of McDonald’s famous Shamrock Shake. 10 pm Regretro: Spice Up Your Life Edition @ The Steady, 1051 Bloor St. W. This month’s Regretro is a Spice Girls-themed dance party. They’ll be playing all of your Girl Power favourites and boy band style icons plus the usual faves. Spice Girls costumes encouraged! As always, requests welcome. 10 pm Grilled Cheese @ Dundas Video, 831 Dundas St. W. Grilled Cheese is back! DJs James Redi and Jon Chetty hold it down on the decks with hip-hop, RnB, reggae, trap, house, Motown, and funk tunes while the George Forman holds it down front and centre with a stack of cheesy slices and a fresh loaf. That’s right – FREE GRILLED CHEESE ON THE DANCE FLOOR! 10 pm Yes Yes Y’all 7 Year Anniversary @ Nest, 423 College St. The hottest, sweatiest, busiest queer hip-hop/dancehall/RnB jam around turns seven! Vybz meets A$AP meets Kendrick meets Cham meets Foxy meets Ciara. Trust Me Daddy (NYC) and DJ Lissa Monet join the YYY Crew this month. $10. 10 pm Rebel Hop @ The Piston, 937 Bloor St. W. Soul, funk, reggae, hip-hop, dancehall, and their relative disciples with DJs Gramera and Linx on the decks! Free before 11 pm, $5 after. 10 pm I Feel Like Pablo @ Camp 4, 1173 Dundas St. W. Music from your favourite rappers past/present all night with some surprises. Music by Sasha and Arun. 10 pm She/She @ Lucky Shrike, 850 Dundas St. W. Wild selections of post funk, disco wailing, NY freak outs, and other tasty plates with DJs Katie Lavoie and Julia Dickens. 10 pm Percolate @ Studio Bar, 824 Dundas St. W. Techno and Footwork producers of Toronto meet up for a night of tempo experimentation and vibey dance vibes. Featuring Sylvermayne (Èbony, X), BSMNT (Philthtrax/Aufect), Sergio Levels (Modern Math), and Cherriep (Philthtrax/Philthkids). 11 pm Diggy The DJ @ The Drake Underground, 1150 Queen St. W. Diggy The DJ (Down With Webster) plays all your favourite hip-hop bangers. $10. 11 am Bellwoods Flea @ Dundas Video, 831 Dundas St. W. Bellwoods Flea is back with a fresh lineup of local artisans and vendors, music, and cocktails! Featuring a carefully-curated, diverse mix of Toronto’s best local artisans and small businesses including art, collectibles, fashion, food, handmade, skincare, vintage, and more + classic film screenings all day, drink specials, music, retro video games, and a fun and friendly atmosphere for all! Until 5 pm. 10 pm Get It Together: Life After Death Edition @ The Boat, 158 Augusta Ave. Kensington Market’s open format dance party welcoming all genres, all styles, and all people. 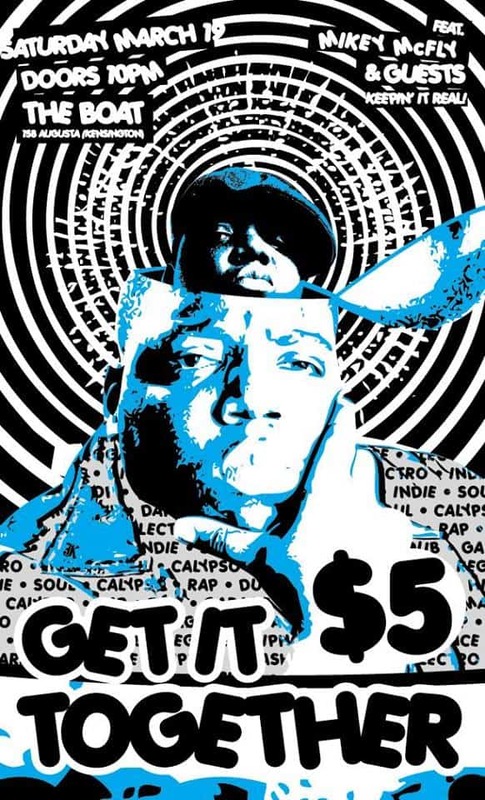 This month, Get It Together celebrates the life of Christopher Wallace (a.k.a. The Notorious B.I.G.). Selections by Mikey McFly. $5. 10 pm Beatlemania @ Clinton’s, 693 Bloor St. W. Why did the Beatles cross Abbey Road? To get to Beatlemania of course! Bangs & Blush will be playing loads of Fab Four tunes + your favourites from the ’50s and ’60s! It won’t be long til you’re twisting and shouting all night. $5 with student ID. 10 pm The Breakfast Club: 2 Year Anniversary @ BLND TGER, 559 College St. The Breakfast Club is celebrating their second birthday! Get ready as they take you back to the ’80s with all your favourite radio hits (Culture Club, Duran Duran, Whitney, etc. ), rarities (Kajagoogoo, Psychedelic Furs, etc. ), and alternative gems from all your favourite artists of the decade. Soundtrack provided by DJ Starting From Scratch. $10 with ’80s gear, $20 without. 10 pm Chronologic @ The Garrison, 1197 Dundas St. W. A dance party through the ages! Pop and antipop from since the end of history (i.e., music from 1890 to 2016, played in chronological order). $5. 10 pm It’s All Good @ The Piston, 937 Bloor St. W. Splattermonkey, General Eclectic, and special guest DJ Efsharp spin all-90s hip-hop, house, and rock! The best all killer and no filler selections from 1990 to 1999, so expect to hear stuff like Wu-Tang, Pixies, Nirvana, etc. Nostalgic moments guaranteed, because It’s All Good, baby! $5. 10 pm Rihanna vs. Drake Video Dance Party @ The Gladstone Hotel, 1214 Queen St. W. Ri-Ri vs. Drake: it doesn’t get much bigger than this! What makes this party special? It’s a VIDEO dance party with DJ Caff, so you can gaze at Toronto’s rap darling and pop’s next Queen all night long. There will be drink specials, live dance performances by The Girls Club, and of course, a sea of Drake and Rihanna tunes to drown in. $10 advance tickets available online. 10 pm new.wav @ The Shop under Parts & Labour, 1566 Queen St. W. new.wave back at it again with the vibes in the basement. Come hit your hotline. $5. 10 am The Leslieville Flea @ The Fermenting Cellar, 28 Distillery Lane. The Leslieville Flea returns to the Distillery District for the winter. A curated market selling vintage, salvaged, up-cycled goods, furniture, antiques, collectibles, and select artisans. Until 4 pm. 10 am Gladstone Flea @ The Gladstone Hotel, 1214 Queen St. W. The Gladstone Flea curates the market to help save you from the thrift store itch. If you’re on the hunt for unique gems, fashion finds, vintage scores and other market must-haves, but hate the idea of spending the weekend knee-deep in thrift store piles, this is the place to be! Until 4 pm. 11 am Toronto Urban Collective: Spring Equinox Pop-Up Market @ The Glass Factory, 99 Sudbury St. Celebrate the first day of Spring with Toronto Urban Collective and shop from a collection of the city’s finest independent artists, craft-makers, photographers, designers, and artisan chefs! $5 advance tickets available online. 8 pm ’90s Trivia Night @ No One Writes To The Colonel, 460 College St. Do you miss Dunkaroos? Did you ever Catch ‘em All in Red or Blue? Is your Beanie Baby collection still gaining exponential value in your closet? Do you identify with Pinky and/or the Brain? Do you remember Will Smith before he got all Scientology all over our butts? If the answer is yes to any of those questions, it’s time to put your knowledge to the test at ’90s trivia night! $10 suggested donation, with proceeds going to Fancy Bits Theatre’s production of Matt and Ben by Mindy Kaling and Brenda Withers. 8:30 pm Screen Queens Presents: Drop Dead Gorgeous @ The Royal Cinema, 608 College St. Screen Queens is Mystery Science Theater + Drunk History + Elvira x lots of booze. Get ready to experience movies like never before. This month, they’re screening Drop Dead Gorgeous, with live and potentially very drunk commentary, special guests, performances, drinking games, and plenty of surprises. $10 advance tickets available online.